An exclusive interview with 1995 500cc World Championship runner-up Daryl Beattie. Daryl Beattie burst onto the 500GP scene with a victory in his debut 1993 season on the way to finishing behind only Kevin Schwantz and Wayne Rainey in the World Championship. A surprise departure from Honda then saw the Australian spend an ill-fated season at Team Roberts Yamaha - during which he famously lost all five toes on his left foot - before switching to Suzuki and battling compatriot Mick Doohan for the '95 title. After suffering a broken collarbone while leading the standings, Beattie kept the championship alive to the penultimate round. Not bad for a guy that got into motorcycling when he won a bike on a children's TV show. But Beattie didn't stand on the podium after '95 - injuries prompting his retirement at the end of '97, at the age of just 27. Casey Stoner retired at the same age, through choice, but Beattie found it hard to accept. Beattie remains involved in motorsport through MotoGP and F1 work for Australian TV and also runs Daryl Beattie Adventures, offering off-road motorcycle tours through some of Australia's most spectacular scenery. He's also applying for a commercial drone licence! Beattie and Mick Doohan battle for the 1995 500cc World Championship. What did you make of the 2014 season Daryl? Marquez was obviously going to continue off his debut season as the man to beat, but I really thought Lorenzo was going to have a big year and step up. That all seemed to change around Austin, when he had the jump start, and then there were a few crashes which just took away all his momentum. From where I was sitting it seemed that without the championship to fight for, he didn't have anything to fight for. There were races where we saw glimpses of Lorenzo's brilliance, but not consistently. Marquez certainly didn't have it all his own way and as we always say, 'when you are that good, you can only beat yourself'. At stages there it looked like he might do that with a couple of crashes later in the year, but he kept it all together and had a great season. As did Valentino. So over the year Marquez dominated. He was unbelievable. While Lorenzo, I felt, had one of the worst years of his career and Dani just didn't capitalise when he could have. I still think Dani is very fast, on the right day, and can challenge for race wins and even the championship. But Marquez clearly deserved another title. The kid is amazing. I certainly hope this year they - Marquez, Rossi, Lorenzo and Pedrosa - all get a good start and Lorenzo especially can get back to the form that we know he's got. Because I certainly feel that Lorenzo can challenge Marquez. What do you think makes Marquez so special? You know, every now and then someone comes along that is brilliant. When I arrived in 500 it was towards the end of the Rainey, Schwantz and Lawson era. So during my time the standout rider was Mick [Doohan], but Mick is very different to Marquez. Mick worked hard to get where he was - as everyone does - but I think there is more natural ability with Marquez. Then after Mick there was Rossi, then I would say Casey. Casey wasn't there long enough to dominate for a long period, but certainly his ability was unbelievable. And now there is Marquez. So from my time onwards there have only been four of those really brilliant guys - and that's not taking anything away from the others. They are all unbelievable riders to make it at that level. But I think in any game you only see that odd one come through maybe once a decade and Marquez is the man of the moment. You only have to watch Marquez at the Superprestigio, or a clip I saw of him the other day (see below) riding feet-up around tyres on the dirt. Like a lot of people I did that kind of stuff as a kid. Dad would put me in a paddock on a slippery surface to ride around the witches hats [cones]. We always want to skip the basics, but sometimes the basics are the most critical thing. Just watching Marquez do that sort of thing - he pushes the boundary with everything. He's pushing the boundary with that dirt bike, feet-up around tyres and he rides a MotoGP bike the same way. He gets the thing in weird angles, it's tucking and turning. I think the difference is that Marquez is frighteningly naturally talented and he's got a head on his shoulders. He's the full package. If you look at somebody like Anthony Gobert - I think Anthony Gobert was probably just as talented as Marquez, if you talk about raw ability on a dirt bike or road bike. But from the shoulders up it was missing. Whether that was his upbringing - to say this in the nicest way - or the drugs that eventually got to him and ruined him. But there was something missing from his package and Marquez is lucky because he's got the full package. I totally agree. Also because they are two different personalities and I think the clash would have been there, but it would have been a great clash. You can see the rapport that Marquez has with Valentino. Obviously Valentino is at the other end of his career, but the respect, rapport and laughs they have is great for television. All the top guys seem to get along pretty good at the moment. But I think if Casey had been there with Marquez, two young guys at the top of their game, we would have seen some more sparks. The next Australian MotoGP hope is Jack Miller. Jack told us in an interview last year that you were one of his heroes, so what do you make of Jack and his jump straight from Moto3 to MotoGP? Well firstly, that's nice of him to say that. It's a shame Jack didn't win the world title. He certainly deserved to. I felt that he was the quickest guy. I'm never made a secret of the fact that I'm a Honda man and when it was announced that he was making the shift to KTM [for 2014] I said on air that I hope it was the right decision. Because knowing Honda they are going to turn it around and bring out a great Moto3 bike the next year. And they did. But the KTM was also very competitive. There was not much between them. I also said that the step from Moto3 - certainly it's not that he can't do it, but it's a massive leap and can't be taken lightly. I know the spec of the bike has changed over the MotoGP tests that Jack has done, but from what we've seen I think he's done a phenomenal job. I certainly think he's got the ability to do it for Australia. I think he's got everything there. I think he's matured massively in the last couple of years, especially his KTM season. I think Aki Ajo was a great leader for him and taught him a lot. At first I was a bit sceptical, but from what I've seen so far I think he's done a great job and is ready to make the jump. 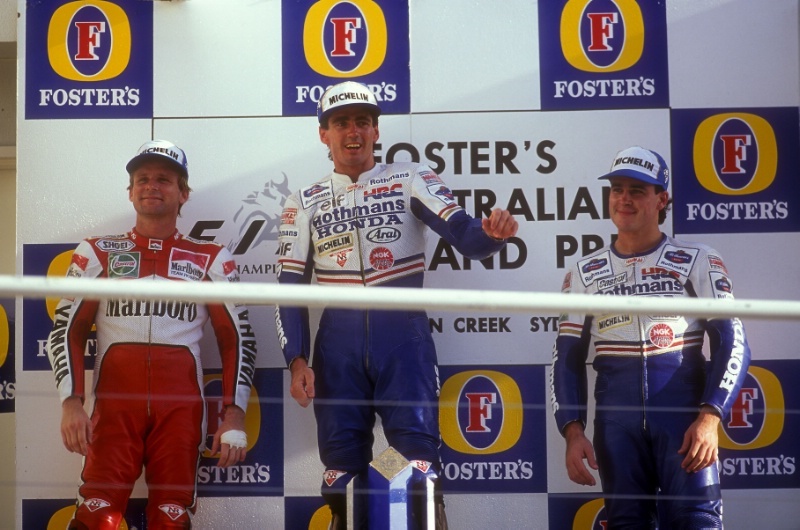 Beattie stands on the podium alongside Mick Doohan and Wayne Rainey in only his second 500GP race, at the 1992 Australian GP. Looking at your career, you'd only started two 250GPs before racing in the 500GP class, how big a jump was it? I was kind of all over the shop at the time! I'd done some 250 wild-cards at Phillip Island, but I was still off the radar and went to race in Japan for Honda. I did some 250 stuff and what they called TT Formula 1, which was like a Superbike but higher spec. They used them for the Suzuka 8 Hour. I was given the opportunity to do my first 500 grand prix in Japan, in 1992, and by the time I raced GPs full-time [in 1993] I'd done nearly a season on a 500 in the All-Japan Championship, which I won. So I had a bit of 500 time before I came to grand prix. Those days in Japan were very good for me. It was very competitive. People like Magee and Goddard had come back from the world championship and then you obviously had Japanese guys who were doing wild-card 500cc races. 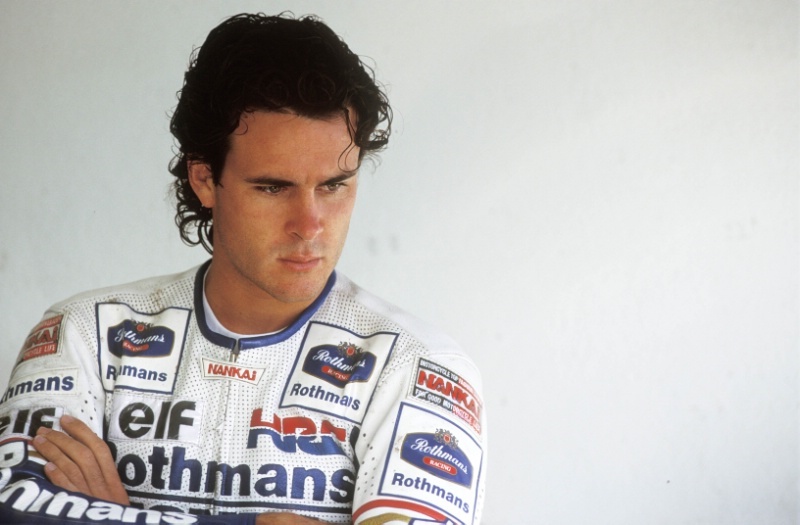 So for me at the beginning of my 500cc career it was a great opportunity to be out of the spotlight, but still race against guys from grands prix. It certainly put me in good shape for my first wild-card and then riding for Erv Kanemoto at Eastern Creek and Malaysia, when Gardner was injured. It also prepared me for when I stepped into GPs full time the following year, in '93. Beattie took the first of his three 500GP wins at Hockenheim in 1993. 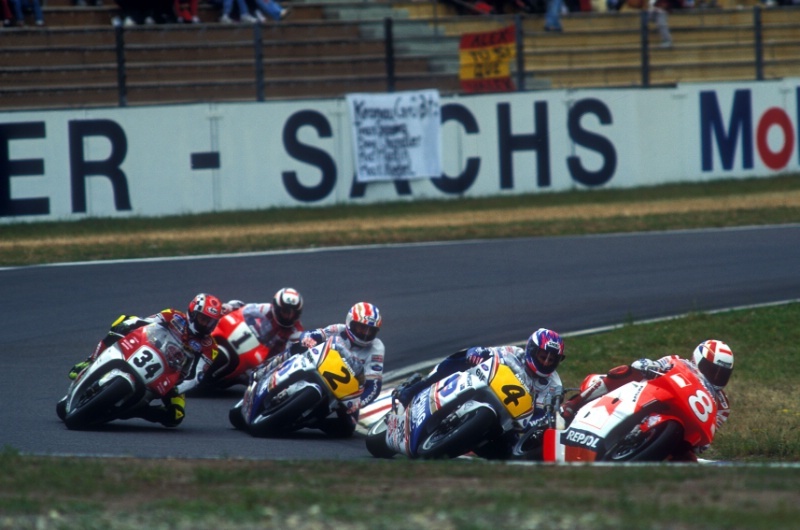 He is pictured second behind Alex Criville and ahead of Doohan, Schwantz and Rainey. You were third in the world championship - behind Schwantz and Rainey - during your rookie '93 season. That's pretty impressive! It was, but at the end of that year Honda said to me they were releasing a new road bike, the RC45, and wanted it to debut in World Superbike with me as the rider. I just didn't want to go to World Superbike. I wanted to stay in grand prix, where they had built me up to be. That is why I left Honda and to this day I wish I hadn't of, because they have such great bikes and are such a great company. 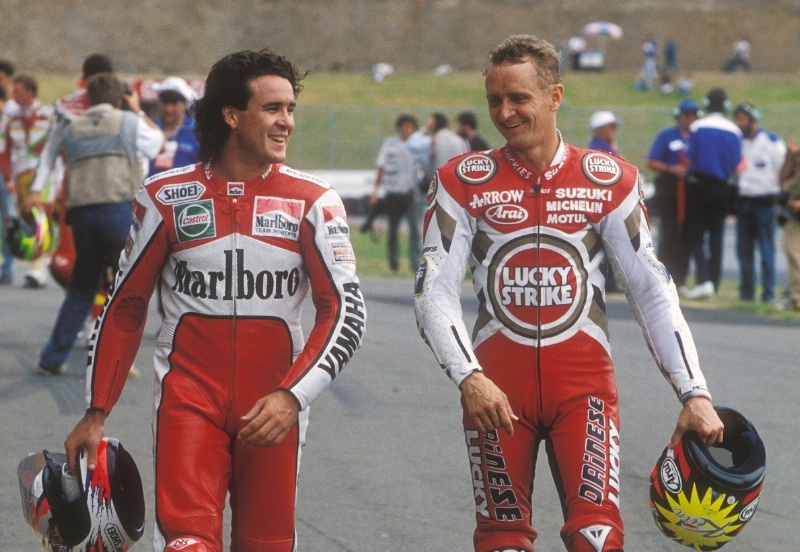 But that was why and so I joined up with Kenny [Roberts] for '94 and what was to be the worst year of my career. Wayne [Rainey] had been paralysed and Yamaha didn't really have a competitive bike that year. We tested a new bike up until February, but it never arrived at a grand prix and we just ran the old bike. That was also the year I lost my toes and eventually Kevin [Schwantz] got me to Suzuki for '95. Leaving Honda was a mistake, but at the time I didn't want to go back to World Superbike. Daryl Beattie, 1993 Jarama 500GP. There was no option for you to stay in grand prix with Honda? That's correct. Honda said they would bring me back to grand prix after Superbike, but after so many years working to get to grand prix and finishing third in my first year, there was no way I was going to go away when I felt like I could do better than that. 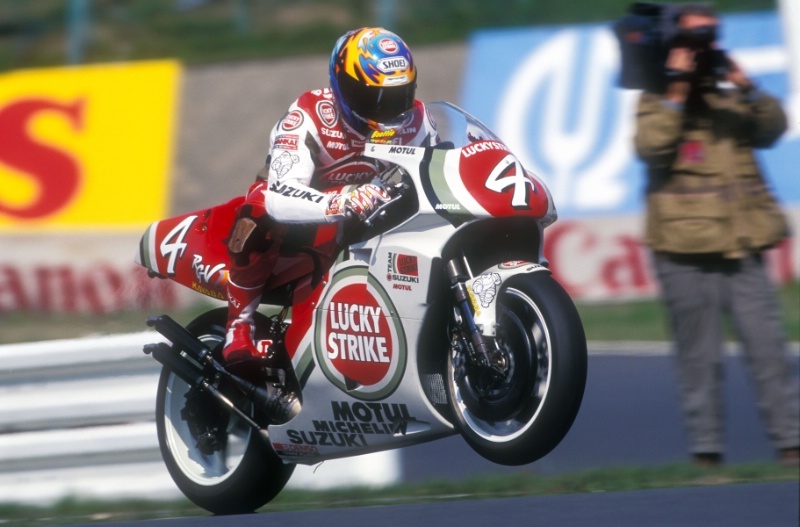 Beattie in Lucky Strike Suzuki colours at the 1995 Japanese 500GP. 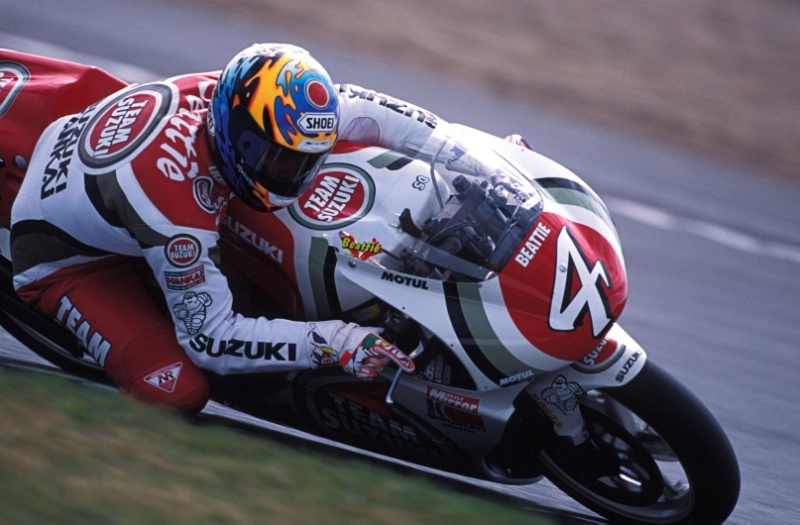 After your worst season in '94, you had your best season in '95 with Suzuki, leading the championship. What are your main memories of that year? I had Kevin as a team-mate at the beginning, but he retired after three races. I was living with Kevin in Austin, Texas and he didn't fly back to Europe with me. So I got to Europe and everyone was like, 'where's Kevin?' That was an eye opener. It was a great year for me. Kevin was very supportive and still came to the grands prix. As you say, I led the championship by I think 25 points until I broke my collarbone in practice at Assen [round 7 of 13]. I missed that grand prix and then fought with Mick for the rest of the year, but Mick got me at the end of the season in Argentina. Beattie, Doohan and Alberto Puig, 1995 Italian 500GP. But a great season and I was on a roll looking to go better in '96, but the new bike had piston troubles. I had two or three big head injuries in testing due to the top of the pistons being torn off. On a two-stoke it was just seizing and I had a couple of big concussions. It was kind of the start of the slide for me really. I missed most of that season after my biggest injury at Paul Ricard. They told me to go away with swelling on my brain. I tried to come back and ride at the end of the year, and again in '97, but just didn't have the same momentum or speed and I couldn't work out why. Eventually I had tests done in Australia and discovered I had middle ear damage, so my balance was off. I found that out a few years later. By then I'd decided I wasn't competitive, then found the reason why. So that was it. The end. I was done young, which was disappointing. I was 27. The same as Stoner. Still, all that happened from winning a motorcycle on a TV show when I was 9 so I can't complain. That's where it all started for you? Did your parents or family have any kind of motorcycle background? What was the TV show and how did you end up winning? It was just an Australian kid's cartoon show in 1979. There was a puppet called Agro and it was hosted by a lady called Jacki MacDonald. One day they had motorcycle on there, a 50cc RM Suzuki, and said 'guess the weight'. So I rang a bike shop and asked how much it weighed! Then my Mum entered the contest and I won a motorbike. So really bizarre, but it turned out to be a fantastic moment in my life. Did you take to it straight away? Yeah, I rode around the bush and Dad said, 'you've got to join a club'. He was good with his hands so he built a bike trailer and we joined a minibike club. I kind of got results straight away, while he worked two or three jobs and bought me 80s and 100s. I won Australian Championships and it all rolled from there. How many years of dirt track did you do? I did six years of dirt track, on circuits similar to the Troy Bayliss Classic. Dirt track really seems to have made a resurgence as far as training for the top grand prix riders? It gives you that feeling and ability to work with the bike under you and gain confidence. Again it's about the basics. So much has changed since the days of Barry Sheene, in terms of the tyres and electronics, but the guys now are certainly tucking and sliding a lot. Dirt track does an enormous amount for that. You can see Marquez's ability on dirt track especially. The amazing thing for me is that he rides his MotoGP bike like he rides the dirt bike. His feel and ability to do that is unbelievable. 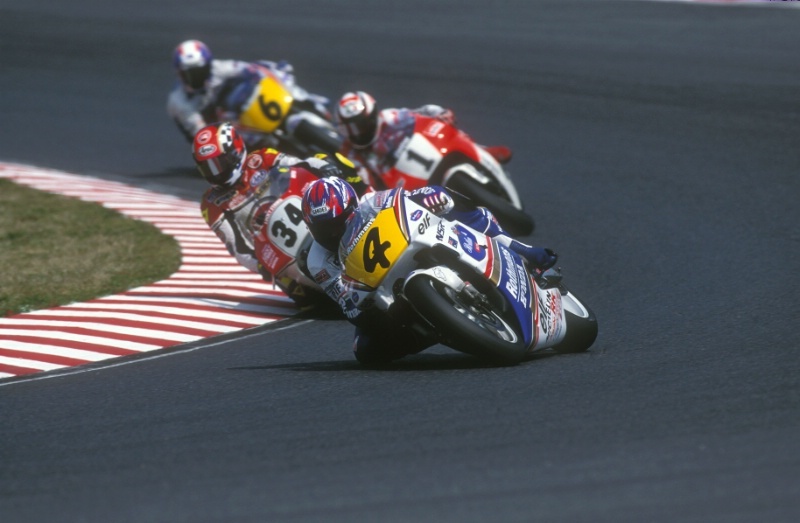 Beattie leads Schwantz and Rainey at the 1993 Japanese GP, during his first full grand prix season. Which of your rivals would you say was the most talented, or the fastest? I think for me Rainey was super special. I don't think the Yamaha was quite as competitive, although the Dunlop had its advantages at times. That was the wonderful thing back then, there was a great battle between Dunlop and Michelin. 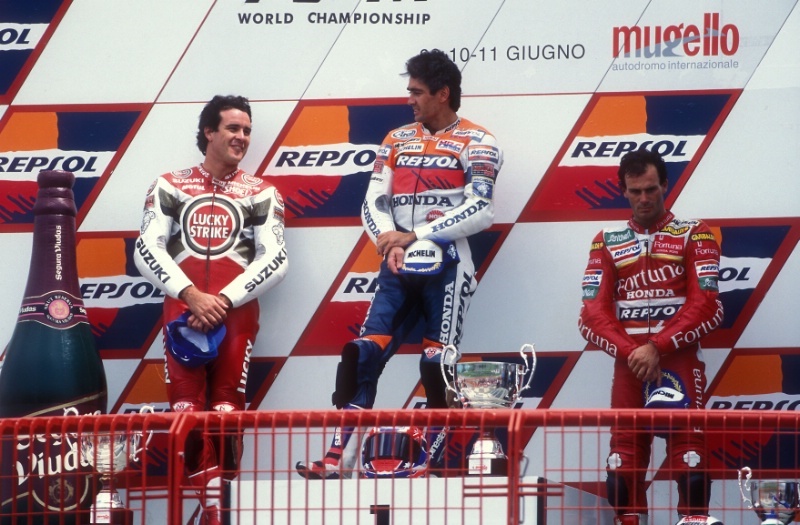 It's hard to pick one rider out between Rainey, Schwantz and Doohan. Lawson I didn't get to race against other than in the 8 Hours, but Eddie was the guy that I looked up to and my favourite in grand prix. I just liked the way he approached racing. He was very laid back about it, didn't have much to say and got the results. I stayed at his house the week before I won my first grand prix at Hockenheim in '93. He was good. Very helpful. Mick was obviously my main rival, so I kind of find him as the one who stands out the most because Kevin wasn't there long enough after I arrived. I would have liked to have stayed with Honda and fought with Mick because Honda were Honda throughout the years of my career. But you take different paths. 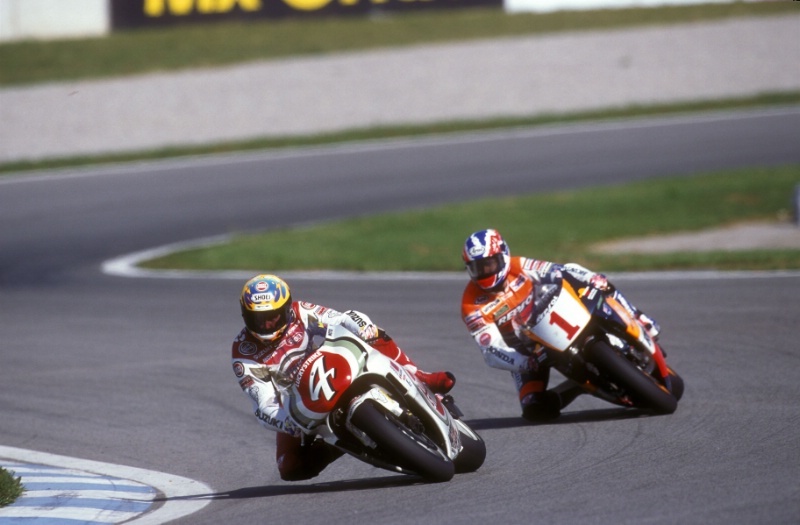 How did you get on with Mick, as team-mates at Honda and then battling each other for the title with different teams in '95? We were really close, really good mates. We both lived in France and we trained together and I guess it wasn't in my nature to be - I was competitive, but I was competitive on the bike. Obviously there was tension in the year that I really challenged him for the title. You could feel that tension and we didn't train together. That was probably a good thing because it maybe threw a little doubt in his mind about what exercises and training I was doing. But we always got along very well. Never any real disagreements, just those challenges on the track. Which of your former rivals do you keep in touch with and how have they changed? We've all changed with age. Especially Mick. He's obviously mellowed a lot. You speak to his former mechanics like Alex Briggs - who was with me when I first started, as well as Mick and now Rossi - he'll tell you some funny stories. Like Mick would ride into the garage, but wouldn't pull the brakes on and run into the mechanics because he was angry about a set-up or something! He was very feisty. A lot like Casey in a way I guess. Really show that emotion. But Mick is mellow now. A different guy. That's not there anymore. We all change with age. I don't see Mick as much as I used to, but certainly several times through the year including promotions for the MotoGP and F1. I also speak to Kevin quite regularly over the phone and by email. Kevin is probably the one I keep in touch with the most. Beattie and Schwantz, 1994 Australian 500GP. It's great to be back in the paddock at Phillip Island each year and meet all the different guys again, like Alex Briggs and Alberto Puig. It's like one big family. One of the Dorna directors, for example, was a cameraman when I was racing. So a lot of people are still there and it's nice to see what they are up to now. How did you find the transition from racing into 'normal' life after your retired? Very difficult. We see it now in Australia with the national rugby league series or some of the big football clubs. Young guys earn reasonable money through their career but often waste it. They are some of the best players in the country but they might not have much education or come from a poor background. Not having guidance to make the next step after your sporting career is difficult. For me, just because I was so young, 27, and walking away from it, I certainly felt lost for several years, even though I was at Channel 10 doing TV commentary within a year or two. That's probably been the best thing for me because it kept me busy and kept me involved. But it personally took me four or five years to really get over it. Not asking myself, 'what do I do today? What am I training for?' Racing had been the main part of my life from a kid and suddenly you lose all that. It's a big change and I can understand why there is so much emphasis now in trying to look after sportsmen post-career. Jobs and things like that. It's very important. Were there any particular things that helped you, or did it just take time? It just took time. My TV commitments helped massively, but I probably didn't ride motorcycles at all for the period when I was coming to terms with my career being over. I wasn't bitter, but I just didn't ride bikes because of the way it all ended. I started again when I began to feel better about things, just riding dirt and road bikes to catch up with friends. But there was nothing in particular that helped. It was just a time factor. 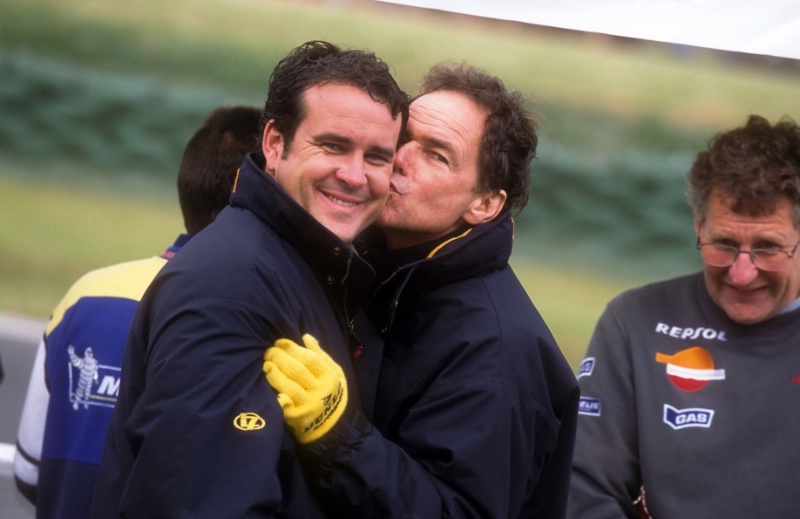 Beattie, Barry Sheene and Jeremy Burgess, 2002 Australian MotoGP 2002. You are getting plenty of motorcycle riding in now with your Adventure tours, alongside your TV work. What is your schedule for 2015? I'm lucky because I've been at Network 10 for over ten years and been doing the MotoGP commentary since then. We are a free-to-air network and a lot of it is starting to go to pay TV, but I've got another contract for this year. I also get to do Formula One in Melbourne, which is a great event and I love working with the British guys like Tom Clarkson and James Allen, who work with us for that grand prix. But I'm really looking forward to MotoGP this year, especially now Jack is in the premier-class. It was difficult with Casey stepping away and having an Aussie again will create more interest back here for us. This will be my second year of the Adventure tours (DarylBeattieAdventures.com.au) which I do in-between my MotoGP commitments. We run Honda CRF450 Enduro bikes and take six or seven guests along. We offer a Simpson Desert trip, which is one of our great deserts in the middle of Australia, a Cape York trip, which is a remote region in the tropics at the top end of Australia, and a Gibson Desert trip, which runs up through the middle of Australia. It's a great experience. You can get a farmer, or a wealthy petroleum or real estate developer on dirt bikes in the middle of Australia and they all become great mates. But if you'd put them together in an airport lounge they probably wouldn't talk to each other. It's been really enjoyable. I guess it comes from my dirt bike background. I've always loved dirt bikes and enjoyed riding in the bush with my mates, especially overnight rides to a pub somewhere for a meal and a few beers. There were a few people doing tours in Australia, I'd done some many years ago and I thought there was an opportunity with my name to take people on dirt bike rides. The idea is to give people a great dirt bike ride in a remote area of Australia that you probably wouldn't do alone, because you need support. We handle all of that, so the guests can just enjoy the ride, experience some really special parts of Australia and improve their motorcycle skills. That's what I've started to create. I'll do more of it this year and see how it unfolds. We've had great support from Honda and Michelin. Fingers crossed, Honda will get back into the big bike adventure market, off the back of the Dakar and things like that. Hopefully Honda will turn up with a bike like the KTM and BMW adventure bikes. I'd love to get into that big bike market and it might also entice more people from overseas to come and see some of Australia with me. At Phillip Island, you mentioned getting a commercial licence for a 'multirotor'. What's that about? I've been flying multirotors - which are Drones or UAVs, whatever you want to call them - and use them to shoot some of the videos from my tours. Regulations are different around the world, but in Australia to be able to shoot video and make money, or use it on television, you have to have a commercial licence. That means you have to go through a safety bureau here, which is CASA [Civil Aviation Safety Authority]. So CASA control it. You have to do exams and flight tests with them to get a commercial licence, which not a lot of people have in Australia. I already have a commercial helicopter licence, so some of that licence helps. Once I have the drone licence it means if, for example, Crash.net wanted some video to be shot, I could do it. So I'm going through all the correct legal hoops. When did you start flying helicopters, did it overlap with the motorcycle racing or was it something you got into after your career ended? I actually did my helicopter licence early on, in 1992, before I went to grand prix. During my final years at school I lived near an aerodrome and I just always liked flying. I'd fly whenever I came home from racing in Europe. I also had a friend who was into aerobatics. He took me up in Sukhoi Su-29 and it was like a grand prix bike in the sky! It was unbelievable. So I did my plane licence as well and just did some basic aerobatic stuff as a buzz. I loved it. Towards the end of my racing career I thought I should do my commercial helicopter licence, so I got that. When I stopped racing I couldn't afford to do the flying anymore! But I went on to do hot air balloons, paragliding, parachuting... I've got licences for lots of forms of aviation. Aviation is certainly something I admire. The trouble is it's so damn expensive, so maybe the drones will give me my aviation kicks from now on. Last question Daryl, after losing the toes you joked about "Hangin' 5 in '95" and you make reference to it in your email address these days - so how is the foot? It's good! I don't really have any problems. If I do lots of kilometres it gets a bit sore, but generally it's fine. I have a bit of limp every now and then but compared with most I've been pretty lucky.